With PAX West ending over a week ago, the details of the over two dozen appointments we had is beginning to get a little fuzzy. 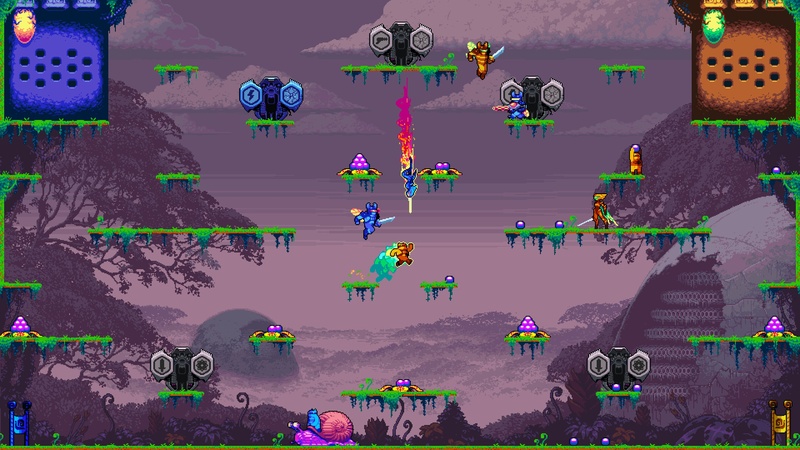 But it’s hard to forget an unmistakably unique game like Killer Queen Black, an arcade-style 4v4 game based on the “arcade eSport” Killer Queen. I’d actually never heard of Killer Queen until shortly before PAX. Perhaps it’s because I just don’t get out much, because Killer Queen is literally focused on the physical arcade experience. And honestly, if you try to just watch the game without having played it, you’re bound to be lost for a while. It’s fast paced and full action, and with that many players on a single screen you can go dizzy if you don’t know what to look for. In fact, the developer admitted that the chaos was better played than watched as I waited for my turn at the small booth at PAX Rising. Despite that, let me make my best attempt to explain the gameplay, which you can see hints of in the trailer below. In Killer Queen Black, there are two teams of four: Blue and Gold. On each team, one player is designated as the Queen. The other players are workers, which look like little chubby gummy bears. The queen has a single form, can fly, and can do a downward dashing attack; she can also activate transformation pods on the stage. The workers, in their default form, can’t attack or fly, but can collect berries and place them in their team’s hive, ride the snail on the stage, or use the transformation gates. These transformation gates turn drones into flying warriors that can (depending on their chosen transformation) use a variety of attacks to harass the other team. There are three victory conditions to a match. The first is the military victory, achieved by killing the opponent’s queen three times (her lives can be seen in pods hanging in the hive). The second is economic, achieved by collecting a full hive of berries (which can be placed, but not stolen). The final is the snail, which can be ridden back to a hive’s base by a worker only. With four enemies to keep an eye on – not to mention yourself and your team mates – it’s very easy to lose sight of the whole picture. The Queen, whose life has a win/lose condition attached, is under immense pressure to stay alive and empower her team through the gates, as well as try to keep her workers defended. Warriors can help take the heat off her some, but as a team, going full out warrior might not be a wise choice. This means that everyone playing has to constantly keep a roaming eye on the snail, the hives, enemy players, and their own Queen. It’s more chaotic than it sounds. It’s also remarkably fun, and anybody’s game. In a “first to three wins” match up of eight strangers off the floor – no devs and only one experienced player, who wasn’t playing Queen – we fought a full five matches. My team had a Queen with no experience, and we took two losses immediately as they got their bearings to the nature of the gameplay. Victory almost looked guaranteed for the other team, but we suddenly turned the game around, winning the next three matches and the full game. Even though I fumbled around as a worker and was by no means very experienced, I was pumped and wanted to play again. Alas, the schedule of a journalist at PAX is tight, and there were other gamers waiting for their turn. It’s exciting to know that this thrilling arcade action is coming to home platforms at last: Killer Queen Black should arrive on Steam and Nintendo Switch this winter. Find out more at the official website!